Former under-secretary in the Minister of Home Affairs, Rvs Mani, who recently wrote a book busting the lies and propaganda around ‘Hindu terror’, has claimed threat to life for speaking up. Rvs Mani took to Facebook and described incidents where he felt threatened because of his views. 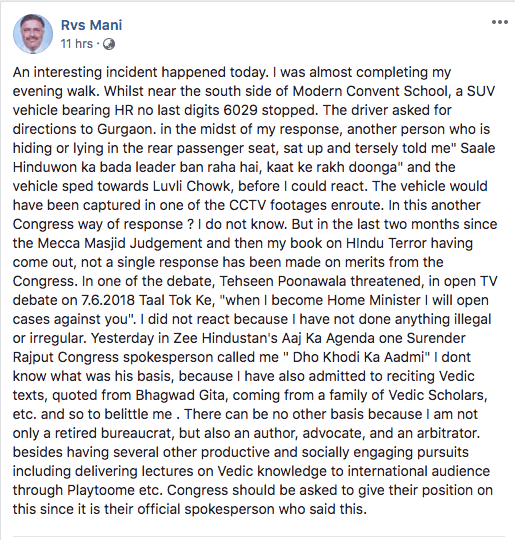 Rvs Mani’s Facebook post where he described threat to his life. In the incident that took place yesterday, he mentioned how after his evening walk, an SUV of Haryana registration, number 6029, stopped and asked for directions to Gurugram. While he was responding, another person lying or hiding in the rear passenger seat sat up and threatened to kill him for ‘trying to be a big leader of Hindus’. Since his book was critical of the Congress government which first came up with the concept of ‘Hindu terror’, he questioned Congress for resorting to threats to silence him. He further said that in two months since the Mecca Masjid judgement, where the special NIA court acquitted all accused tearing apart Congress’ ‘Hindu terror’ smokescreen, not a single response has been made on merit from the Congress. He claimed that Tehseen Poonawalla, Congress supporting motormouth who is not related to the respectable Poonawallas, threatened him openly during a TV debate saying that when he (Tehseen) becomes the Home Minister, he will open all cases against Rvs Mani. Another Congress spokesperson, Surender Rajput referred to him as a worthless person. He further asked Congress to clarify their position since their official spokesperson used these words. Earlier, Rvs Mani had alleged that the changes in the second affidavit regarding Ishrat Jahan case were made at the ‘political level’ by the UPA led government. He had also said he was ‘tortured’ by Satish Verma, the Special Investigation Team (SIT) chief in that case, to sign it. In an interview earlier this year, he had revealed how the UPA government tried to frame Col Purohit because he was breaking the back of the groups involved in Islamic radicalization. He has filed a complaint to the Police Commissioner and Joint Commissioner, West, Delhi Police in this regard.